At least 78 people were killed on Sunday when two suicide bombers blew themselves up at a church in northwestern Pakistan in what is being called the worst attack on the country’s Christian minority in decades. The suicide attackers targeted worshippers as they were coming out of the All Saints Church following Sunday Mass in the troubled city of Peshawar. Local officials said that seven children and 34 women were among the dead. 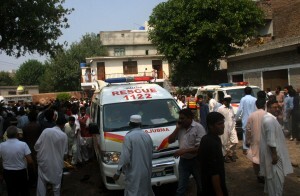 Some 37 children were among the more than 130 wounded in the attack. A few hours later, the Taliban-affiliated militant group Jandullah claimed responsibility for the attack saying it was in response to US drone strikes against Pakistanis. Hundreds of Christian protesters angrily demonstrated in Peshawar and Lahore saying the government was not doing enough to protect its visible minorities. Sunni militant groups linked to the Taliban have attacked the Shia minority as well. At least 89 people were killed in a produce market in Quetta, Baluchistan’s provincial capital in southwestern Pakistan, in February. A month earlier, a bomb in a market in Quetta killed 11 people and wounded dozens. Later on the same day, dual blasts – set off by a suicide bomber, followed by a car bomb 10 minutes later – killed at least 81 people and injured more than 120 at a snooker hall in the city. Both attacks targeted areas where the Shia community is the majority. The attacks on minorities have given fuel to critics of the government’s new initiative to bring militant groups to the negotiating table. Prime Minister Nawaz Sharif has been trying to woo the Pakistani Taliban into peace talks. On Saturday, he ordered the release of Abdul Ghani Baradar, a senior Taliban official, in a good will gesture.